More Michigan Wine and Antiques! Normally he works at 3 am, so if he was supposed to be at work, he would have been VERY late. I had already turned on the lamp so I could figure out how to turn off the alarm, so he could see we were in a hotel room, but somehow it didn’t register. He looked really confused until I said, “Jon, we are on vacation!” After that, he promptly crawled back in bed and was asleep as soon as his head hit the pillow. It gave me quite the chuckle! So, after our nice sleep we got moving. We had a few things on our agenda for the day. First, Jackson, Michigan has an antique mall that I had seen online, and I wanted to do a little antiquing! After we got ready and got our stuff all packed up, we headed to downtown Jackson. The antique mall was good sized, three stories, and had several pretty cool items and a lot of things that were reasonably priced. Jon fell in love with a 1960s sideboard that was being sold as a set with a dining table and 4 chairs. All were in good condition and a nice maple finish. And $149! Too bad we couldn’t lug a dining room set on the plane! After the antique mall, we moved on to our original purpose for being in Jackson. Sandhill Crane Vineyards. Back in April, I entered a contest on the Michigan By The Bottle blog, and won a $40 gift certificate to Sandhill Crane Vineyards (thanks MBTB!). Of course, at that point, we didn’t have a trip to Michigan planned, so we didn’t get to use it until now. 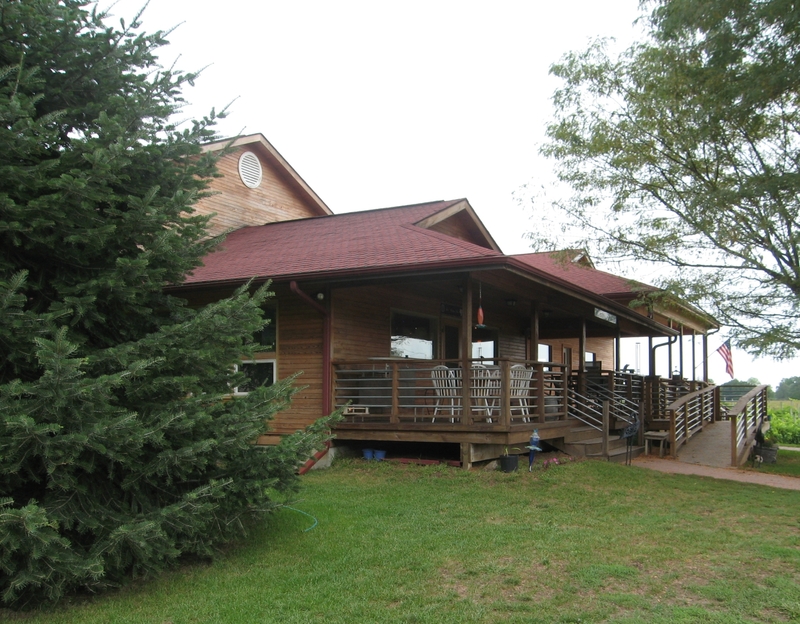 Sandhill Crane is located in the country outside of Jackson, and has a mountain cabin getaway style tasting room and cafe. The tasting room is surrounded by vineyards, which produce about 10% of the winery’s grapes. We arrived in time for a late lunch in their cafe, which uses lots of locally sourced ingredients. Jon and I tried the Michigan salad, with walnuts, dried cherries and feta cheese, the Sausage and Kale soup, and The Mozz, a panini with mozzarella cheese, pesto and tomato. 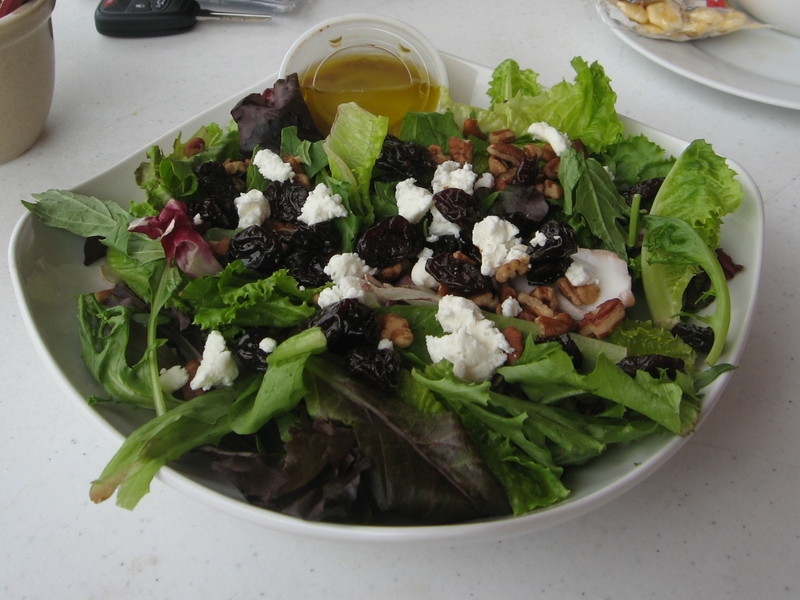 All of our food was fantastic, and we enjoyed sitting outside on the covered deck with the view of the vineyards. It was quite peaceful. After lunch, we headed back inside to do our tasting. 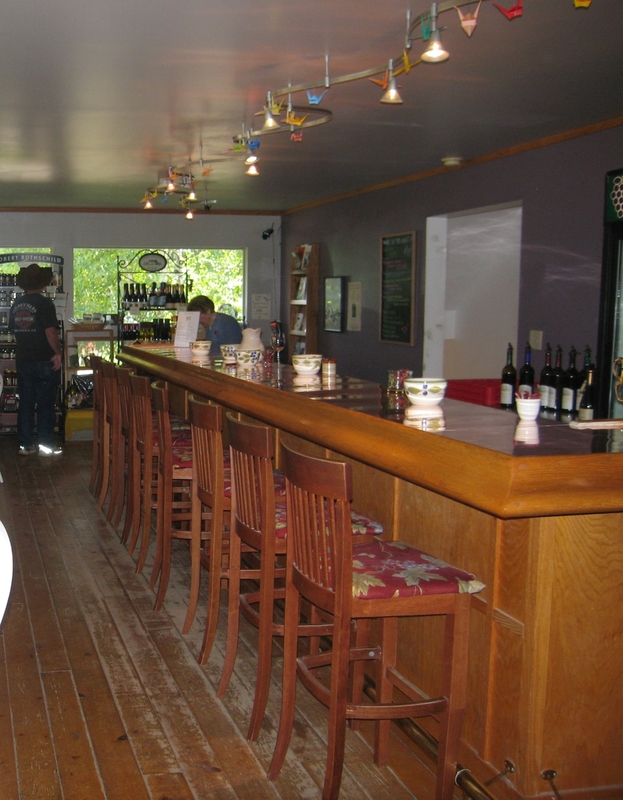 The tasting is complimentary at Sandhill Crane, and you can try as many wines as you like. There is only one exception, a Port style wine that you can sample for $5. The list of wine is… EXTENSIVE. There are 34 wines on their tasting menu! There are whites, reds, sweet and dry wine, Port style, fruit wines and even mead! That made me a little nervous, because many wineries that try to be in the market with such a broad scope don’t truly master any of them. So, here are my impressions. I’m going to go list style, to try to keep it readable. Chanson – This wine is made from the Chardonel grape, which we don’t see at home. It was a mixture of crispness and buttery, like a balanced Chardonnay. Jon really liked this one and I did too. 2011 Vintner’s Select Riesling – This was a light clean wine, with a lot of apricot on the nose. A great light summery wine. Sassy Rosé – This is a very light acidic Rosé, made from the Cabernet Franc grape. It has a light flavor of strawberry. 2008 Cabernet Franc – For a Cabernet Franc, this wine had a very light mouth feel. I felt like it had a bitterness on the back of the throat that wasn’t appealing. 2008 Merlot – This lightly oaked Merlot had a nice balance of acidity with a some strong black pepper flavors. A decent wine. 2008 Cabernet Sauvignon – This Cab was very heavy on the nose, but was a nice balanced Cab without the heavy oak that many Cabs have. I liked it, but Jon thought it was too light. 2010 Noiret – This is a grape I had not heard of. It is a dry, Italian-style wine, with raspberry flavors and light tannins. Drink now. 2009 Proprietor’s Reserve Chancellor – This one was nice – with light tannin and raspberry flavors. 2011 Vidal Blanc – Another varietal that we don’t see at home. Flavors of peach, apricot, and pear with a slight sweetness. My mom would like it, which means it is a sweeter wine. Serenade – This wine has a strong citrus nose, and has a thick, syrupy mouthfeel. It taste of peach and citrus fruit and is very sweet. Heirloom Apple – This is an apple wine, and I thought it was so-so. It was my first every apple wine, so maybe that is how they are supposed to taste, but it just wasn’t my thing. 2006 Port in a Storm – This Port Style wine is made from Frontenac and Chambourcin grapes (two more varietals we don’t see in Washington). It has flavors of plum and chocolate and high alcohol content. Sweet Ellie – Sweet Ellie is named for the vineyard dog and is primarily Traminette with Vidal Blanc, Vignoles, and Chardonel. It is sweet, but not overly so, with a caramel flavor mixed in with the fruit. Mood Indigo – This wine is a Port-style wine made from blueberries. Very good, with a balanced sweetness to counter the high-alcohol content. It would be excellent drizzled over cheesecake or caramel ice cream. I learned a few things that day. First, the Michigan palate tends toward a sweeter wine than us Pacific Northwesterners. I have gotten so used to tasting and drinking wines from Washington, California and Oregon which tend to make big bold tannic reds and more dry, crisp whites. Michigan wines are much sweeter – certainly not a bad thing, but something you have to get used to if your experience has been with drier wines. Second, there are a heckuva lot of varietals out there! At Sandhill Crane alone, I tasted several that I had never heard of before! So, if you are ever in the Jackson area, stop by and give Sandhill Crane a try. I’m glad we did. I’m not sure how I manage to get talked into these things – but this is the third year in a row that I will be completing a half marathon. And the third year in a row that it will not be the Wine Country Half Marathon in the Willamette Valley of Oregon. I must be really dumb, because if I’m going to walk 13.1 miles in one fell swoop, there should at least be a wine tasting at the end. The half marathon is next weekend, and it is a fundraiser for Girls on the Run, which is a non-profit program that supports girls in developing self-esteem and a feeling that they can be whatever they want to be, through healthy lifestyles and running. I suppose if I’m going to torture myself – it might as well be for a good cause! I do have high hopes that this will be a fun half marathon at least, because they are advertising the chocolate mile (where you get chocolate at a certain point!) and tiaras. Yesterday after work my friend Shelley and I set out for our last long training walk before the race. 10 miles! When we set out, it was sunny and warm. I knew we’d be getting back after dark, so I brought my flashlight. And we walked… We talked about all the usual subjects – work, kids, cats, spouses, friends, annoyances… Somewhere around mile 5, we were all caught up on life and getting bored. We tried coming up with entertaining things to talk about – but after 8 hours at work and 6 miles down, we were failing. Somewhere around mile 7, we were getting tired. During the same 7th mile, it got dark. At least the moon was stunning – because the walk kind of sucked at that point. We had an extensive discussion about what we would be eating, if only we weren’t stupid enough to walk 10 miles. We went through our list of wants: beer, massage, chiropractor, hot bath… and wine of course! Pumpkin bread was in there too. The 8th mile we spent talking about how many miles we had left. Mile 9 was that big hill! And we talked about that one time I got attacked by the owl. Yep! Once when Shelley and I were walking, early in the morning before the sun came up, an owl swooped down and grabbed my head! I was wearing a hat, so it didn’t hurt, but it sure scared me half to death! So, that was a plus… last night I was not attacked by an owl! And mile 10 – at least the end of it – was awesome! Because we were done! I would like to say next weekend will be different – that walking 13.1 miles will be a breeze. But I’m sure we’ll be bored, tired and in pain. But in the end I can say I did it again! I’m tired tonight… Last night Jon and I got home from a trip to Chelan, Washington, where our lungs were subjected to a thick cloud of smoke hanging heavy in the air from the wildfires that are burning too close to people’s homes and lives. There was a fire burning 10 miles outside of town, and although the flames weren’t visible because it is on the other side of a ridge, the stagnant air was heavy with smoke. You want the wind to pick up and blow the smoke away, but you can’t hope for that, because it would make the fire spread that much more quickly. I headed over on Tuesday for a work conference, and Jon followed on Friday for what we hoped would be a weekend of hiking, wine tasting and enjoying what is sure to be one of the last beautiful summer weekends in Washington. Unfortunately, the fires eliminated any chance of getting good hiking in, both because many of the state parks are closed due to the fire danger, and because my lungs and my asthma were feeling the effects of the smoky air. So we went wine tasting and had a leisurely, non-active weekend. I’ll be sure to post more about the trip soon. After arriving home, my oldest cat Martini was so excited to see me she didn’t want to let me out of her sight. She lay down with me at bedtime, and was purring so loudly that I thought she was going to overheat and explode! Actually, I joke about it now, but I was really quite worried, because her purring was so raspy and heavy that I was concerned that she had some sort of a respiratory infection. 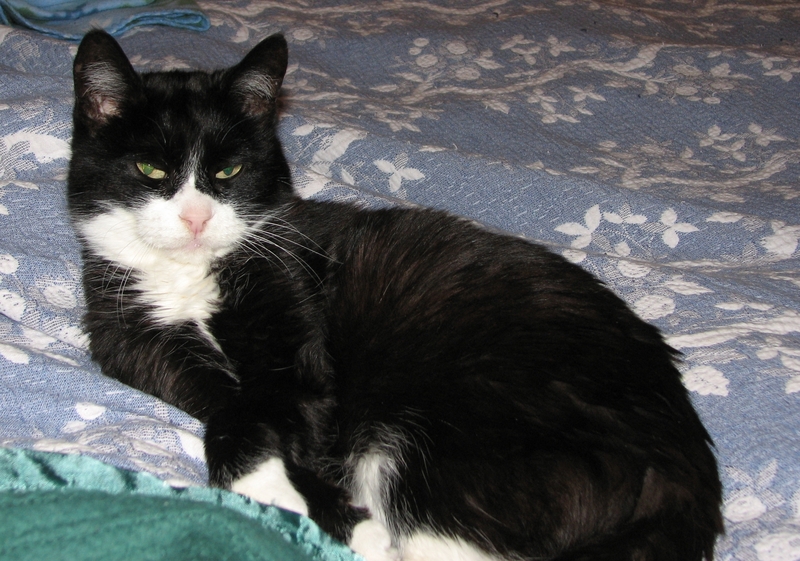 Her breathing was quite labored, and she would not stop purring. Normally, when I wake up in the middle of the night I pet her a little, but I didn’t want to pet her for fear that she would NEVER stop purring! She purred for hours… Right in my ear… this raspy, labored purring. I thought my first call in the morning would have to be to the vet. Thankfully, at 4 in the morning (yes, I was awake that whole time, worried about the respiratory infection…) she finally settled down and went to sleep. And I could finally get some too. Today her breathing was fine. So I guess I have to chalk it up to her just being that glad to have her momma home. Whoever said cats are aloof has never met mine. 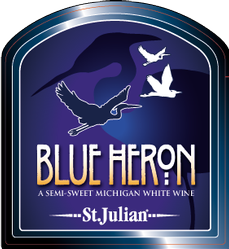 Tonight I am sipping Blue Heron, by St. Julian Winery in Paw Paw, Michigan. St. Julian claims to be Michigan’s oldest winery, and I have no reason to doubt that it is. St. Julian was founded as Border City Wine Cellars in Ontario, Canada in 1921. In 1934, after Prohibition was repealed, owner Mariano Meconi moved the winery across the river to Detroit. By this time, the name had been changed to Meconi Wine Company. Next came a move to the other side of the state in 1936, to Paw Paw, Michigan, which is in the southwest corner, and one of the state’s best wine growing regions. With the move to Paw Paw, he changed the name to the Italian Wine Company – geez, make up your mind! He changed the name one more time to St. Julian Winery in 1941, in response to the anti-Italian sentiment that was growing during World War II (ok, I gotta give that one to him). St. Julian was the patron saint of the town of Faleria, Italy, where Mariano Meconi was born, so he honored his old hometown with the last name change. So, from 1921 until today – this winery has been producing wine for over 90 years! That’s pretty good! Anyway, Blue Heron is a blend of Vidal Blanc, Seyval Blanc and Riesling, and is labeled a semi-sweet wine. I actually consider it to be a sweet white, with a nose of floral scents and honey. It tastes of tart, crisp apple and honey. It reminds me quite a bit of Chateau Ste. Michelle’s everyday Riesling, which is one of my favorite inexpensive, night-at-home wines. Jon picked this one up in Michigan at the grocery store, without knowing anything about it, and for $6.99 for the bottle, he scored! After my birthday dinner out on our Michigan trip (Cracker Barrel! – although I do like Cracker Barrel, he still owes me a real birthday dinner), Jon and I stopped at the local Meijer in Jackson, Michigan to sample a few Michigan wines. We picked a red and a white that we hadn’t heard of before, with no research on the wineries, the wines, or the reviews of them. Jon chose a red – and I chose a white. We got back to the hotel and busted out the corkscrew that lives in our suitcase and broke out the hotel plastic cups. We didn’t do this officially – as in taste the white wine before the heavier red. Jon prefers red wines, so he opened that one first. The red was a bit of a disappointment, very fruity, not much structure, and it contained an odd fizzy texture. It was certainly drinkable, but just one of the best wines we have had. But that’s all I can tell you, because neither of us can remember what the red wine was! I picked the Grand Traverse Select – Semi Dry Riesling. At $7.99 for the bottle, it wasn’t going to be a big disappointment if we didn’t like it. This wine was much better than the red Jon picked. It has a faint pear nose – it may have more scent than what I was detecting, but remember, I was sampling from a plastic hotel cup. The mouth-feel is slightly syrupy, which gives way to a pear and golden delicious apple flavor, with a nice amount of acidity. It wasn’t anything special, but it was certainly a solid pick for a night at home – or in a hotel with a plastic cup! So there you have it… Completely unscientific, unprepared and totally random wine tasting. Get out your plastic cups – you know you want to! After we left the Motown Museum, we headed to our next downtown Detroit destination – the Detroit Institute of Arts. 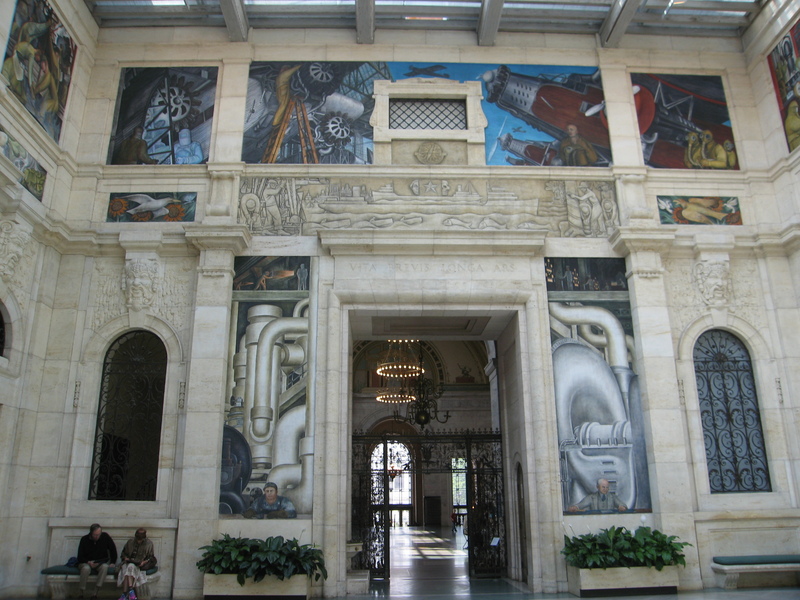 The DIA was built in between 1923 and 1927 in the Beaux-Arts, Italian Renaissance architectural style. The museum is made of white marble, and is absolutely beautiful! It provides a stark contrast to some of the nearby urban decay. After a renovation of the building in 2007, the museum contains over 100 galleries and 658,000 square feet of gallery space. The building and collections are technically owned by the City of Detroit, but an endowment and foundation are responsible for fundraising and paying the museum’s expenses now. It truly is a success story in a city that has had more than its share of troubles. So, the collections… First, let me say that it would be impossible to see all of it in one day. This would be a great museum to be a member of if you lived in the area. We started off perusing some of the collections on the first floor, which include Native American baskets and pottery, Mayan and Incan figures, and masks. Then we headed upstairs, where we walked into a gallery with a series of two-story Diego Rivera murals covering all four walls. If you see nothing more in this museum, these murals make it worth the price of admission (and if you live in the three closest counties – you can go for free!). The murals explore the story of the manufacturing industries in Detroit. 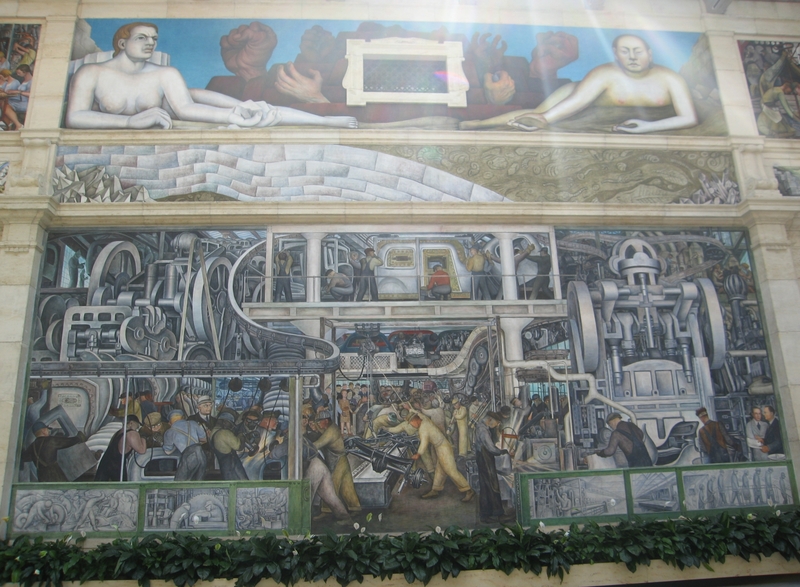 Rivera was known for depicting the indigenous cultures of Mexico, and the DIA murals are considered to be a depiction of industry and technology as representing the indigenous culture of Detroit – an interesting way of seeing the auto empire of the 1930s! 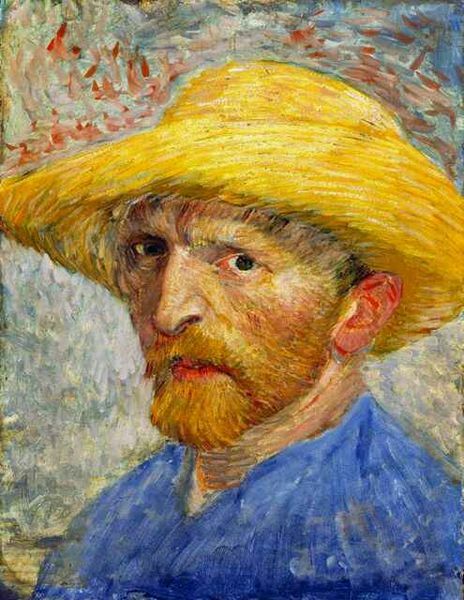 The museum also has several lithographs and etchings by Pablo Picasso and Henri Matisse, and paintings by Picasso, Matisse, Van Gogh, Monet and Rembrandt. They even have a giant Andy Warhol self-portrait. 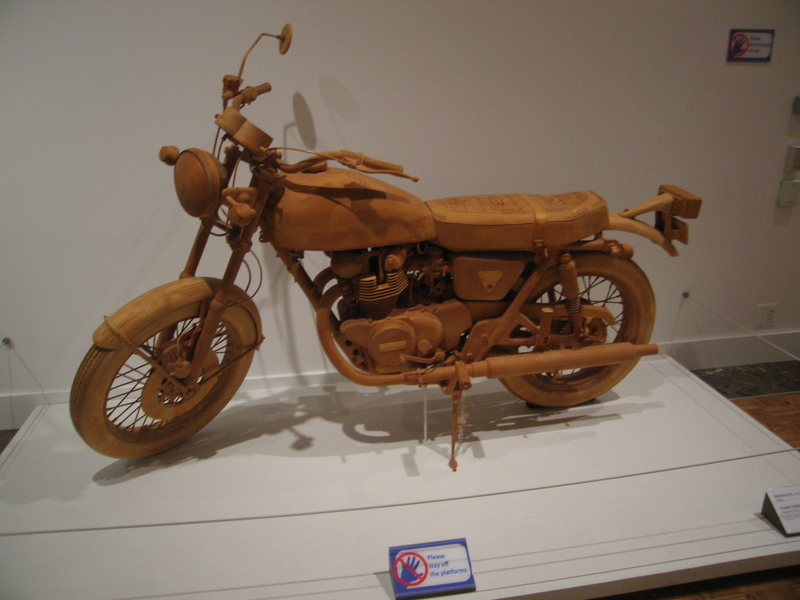 They have a motorcycle carved from one piece of wood, which is extremely intricate, and an exhibit of beautiful blown glass pieces. Near the blown glass is their modern art area. If you have been following this blog for long, you know that modern art isn’t really my thing. However, they had some pretty cool modern art pieces (I can’t believe I just said that)! 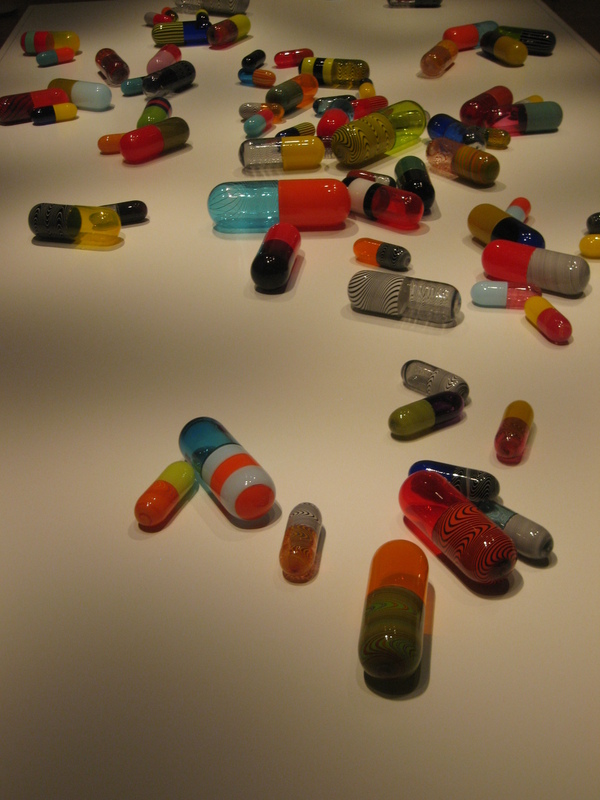 Modern Art – Blown Glass Prescription Drugs – For the Baby Boomer Who Has Everything! So, here’s the sad thing about the Detroit Institute of Arts. We were mostly alone… Some of the popular exhibits had maybe a half dozen people looking at the artwork, but in the permanent collection areas, we were generally by ourselves (except sometimes an attendant). We went down to lunch in the cafe, and Jon loved the pay by the ounce salad bar, and I had a delicious sub sandwich. The cafe was crawling with people and I thought all the patrons had just gone to get a bite to eat, until I noticed that about 80% of the people in the cafe had employee badges around their necks. It struck me as pretty sad that there would be so few people taking advantage of seeing all this amazing artwork – especially when it is free for county residents! I know it was a Thursday and all, but… I would love it if we had a museum like this at home! We got some tea and coffee and picked up our car – which took awhile (in fact I’ve never had a car rental take so long! – they were EXTREMELY thorough – annoyingly thorough), and headed out on our way. We thought we would plug our first destination into the GPS, be on our way and find a place to stop for breakfast along the way. Well, it didn’t really work out like that. Pretty soon we were in the middle of downtown Detroit (and not a nice section at that…) and there were not any restaurants to be found. We finally had to settle for McDonald’s. Eh… birthday breakfast was a bit of a letdown! Our first destination was the Motown Museum, but after breakfast, we still had an hour and a half to kill before the museum opened. The Motown Museum is in a section of Detroit that is in the immediate vicinity of several abandoned homes and boarded up businesses. In the morning, you don’t feel like you are going to be mugged, but I don’t think I would want to be in the area at night. And I certainly didn’t want to spend an hour and a half walking around the neighborhood – although normally walking around neighborhoods is a favorite activity of mine – this would not be the place for a stroll. So we backtracked out to a shopping mall in a safer area and did a little browsing. And we found some great clearance deals on some clothes – icing on the cake! So after killing an appropriate amount of time – it was back to Motown we went! A bit of history on Motown for you… Motown was the second record label founded by Berry Gordy, Jr., who borrowed $800 from his family’s savings fund to start a record company (the first label was Tamla). The company was founded in 1959 and throughout the 1960s and 1970s was run from a home in Detroit, with a studio that was a converted garage in the back of the house. The home was nicknamed “Hitsville U.S.A.” and is still called that today. Berry Gordy, Jr. was very strategic about how he operated his business, and made it his mission to fully transform his artists into stars. When he signed an artist, they went through a very thorough process, that included voice lessons, etiquette lessons and dance choreography. He also understood that artists were still very much judged by the color of their skin, so in the beginning he released records that did not have a photo of the artist on the cover. That way, people wouldn’t dismiss it without even listening to it. Radio stations in the 1960s frequently had a policy to not play more than three songs by any one label each hour, so Berry created multiple labels to get maximum air time. Over the history of the company, Motown Records had over a dozen individual labels. Creative way to get maximum exposure! Other innovations in music recording included an echo chamber, which was basically a hole in the ceiling that echoed back sounds when people made noise underneath it. If you snapped your fingers, or stomped your feet while standing below, the sound would echo and have more volume and substance. Motown hired high school students to snap fingers on recordings. 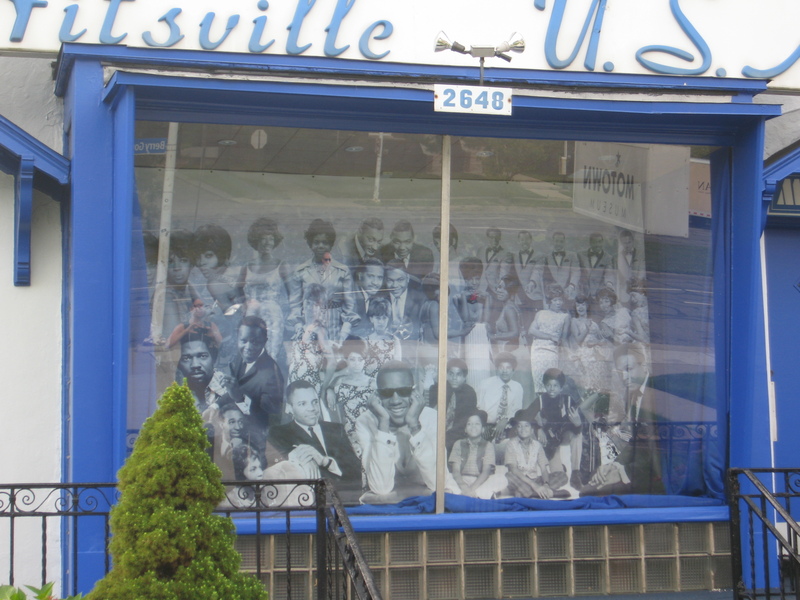 The tour of Motown Records and Hitsville U.S.A. included the early administrative offices of the company, the recording studio, and the upstairs living quarters where Berry Gordy, Jr. lived before buying a mansion in the Detroit historic district. The furniture throughout is original, and very early 60s. Back in the 1960s and 1970s, it was very much a simple family operation, boxing records for shipment at the dining room table. And Smokey Robinson frequently spent the night on Berry Gordy Jr.’s couch when he was too tired to drive home after a late night recording session. It was neat to try to imagine all the stars whose music we have heard over the years recording their music here. Stevie Wonder, The Four Tops, The Temptations, Diana Ross, Michael Jackson and the Jackson 5, and many others! The tour begins with a video about the history of Motown, and has lots of fun video clips and historic photos. Then they take you upstairs for the guided tour. It is interactive, with our guide bursting into song and trying her best to get all of us to sing too! Actually, although I am not a singer (you cannot get me drunk enough to sing karaoke), I did sing along – albeit quietly! She demonstrated how the echo chamber works – and showed us where stars stood while recording in the studio. If you find yourself in Detroit looking for something to do, I would recommend the Motown Museum. It was a fun way to spend an hour! Again, we’ve been out of communication for awhile and for that, I apologize. But we had the opportunity to travel again – this time to Michigan – home to most of my extended family! It was a crazy week, trying to get ready to go, and the night before we were supposed to fly out, I had to work until almost 8:30 when we decided to keep working on a contract negotiations that was so close to a settlement! After work on Wednesday, September 5, Jon and I drove down to Seattle, had a delicious dinner with Jon’s sister and brother-in-law, and flew out on a non-stop red-eye to Detroit, due to arrive at 6:10 am. Our flight was completely booked! The purpose of the trip was two-fold – my cousin was getting married in East Lansing on the Michigan State University campus, and my grandmother is 95. It worked out that I could squeeze a week’s vacation in between my coworkers’ time off and get enough of a reprieve from union negotiations to get 5 full days with no negotiations at work. Once I had those days scheduled I had to guard them with my life though – there were several times I was asked about these dates – not available! Obviously, the red-eye has its drawbacks, one of which is not getting a great night’s sleep on the plane. We learned on our trip to the South that we can make it through the day without much sleep, as long as we don’t have too long of a drive after we get there. The days leading up to the trip were really busy, so we didn’t have that long to research a few things to do. I did have a few things on the itinerary, for the couple of days we had before meeting up with the family. 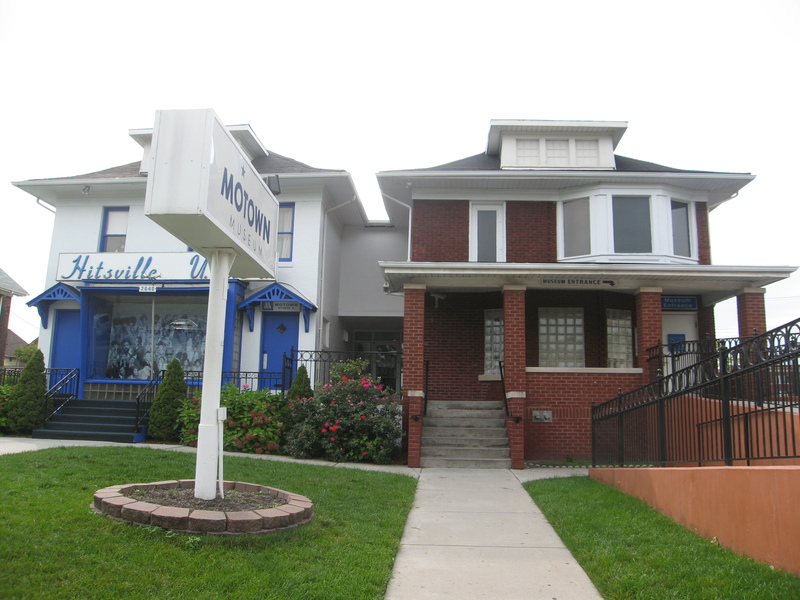 The Motown Museum – Jon is a music fanatic, and this has been on his list for a long time. Motown is the record label founded by Berry Gordy, Jr. with an $800 family loan. The tour includes the studio where Motown hits were recorded in the 1960s and 1970s. The Detroit Institute of Arts – We were debating about either visiting this world renowned art museum, or the Titanic artifact exhibit at the Henry Ford Museum. The Detroit Institute of Arts won out. Sandhill Crane Vineyards – I won a gift certificate to their new cafe on a contest on a wine blog back in April. I was pleased, but we didn’t have a trip to Michigan scheduled at that time – so I had to wait until I would be visiting! So we made sure we would be able to visit! And for Jon, Encore Records in Ann Arbor – Again Jon is a music fanatic, and on his bucket list is a goal to visit each of the top 25 best independent record stores in the nation (actually he only has to visit 24 now – since one has since closed). This record store would be his third. I just found out about this unique goal the other day – so I suppose I will be visiting record stores even more than I already do! The rest of the trip would be played by ear – fitting in what we could in between visiting family and traveling to the next location. Now that we are home, I’ll tell you all about what we saw and did in upcoming posts! Stay tuned!